GSMArena team, 20 February 2019. 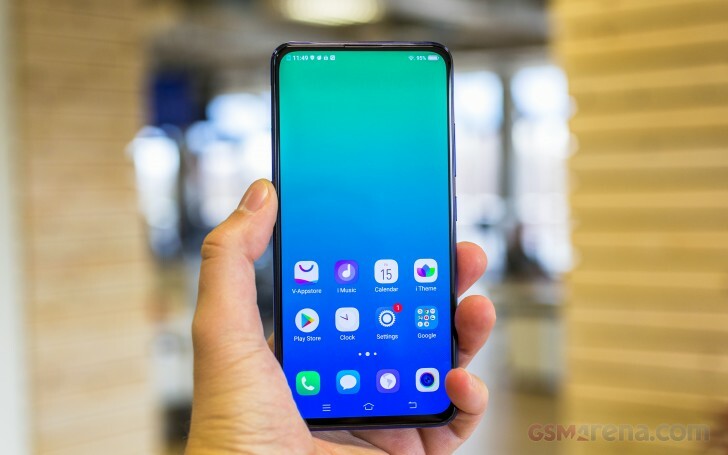 After the release of two high-end, exotic smartphones from the NEX lineup, vivo is ready to bring the periscope selfie camera to the mid-ranage segment and the V15 Pro is the first one to benefit from it. The smartphone looks and feels like a flagship, offering rare features like full-screen display, pop-up selfie cam and under-display fingerprint reader. Additionally, the V15 Pro's photography skills seem mightily impressive. The rear triple-camera setup is highlighted by the brand new 48MP 1/2" sensor, while the elevating module on the front holds a 32MP selfie camera. And that's not all. 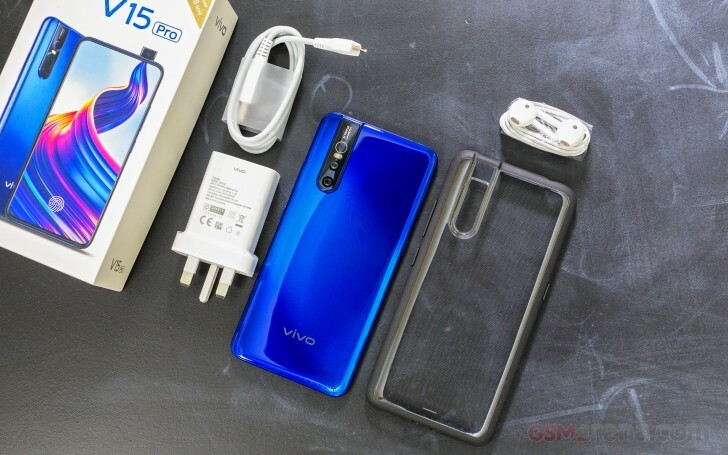 The vivo V15 Pro is also the first handset to take advantage of the Snapdragon 675 chipset. We are curious to see where it slots as seeing how the Snapdragon 670 was already pretty close to the 710, the 675 might give the more premium chip a run for its money. Screen: 6.29" FHD+ (1080x2340px) Super AMOLED; 19.5:9 aspect ratio. Camera: Primary: 48MP Quad Pixel Sensor, f/1.8, 1/2", 0.8µm + 8MP Super Wide-Angle camera + 5MP depth sensor. Selfie cam: Primary: Pop-up 32MP. Chipset: Qualcomm Snapdragon 675 (2x Kryo 460 cores @1.7 GHz and 6x Kryo 460 cores @2.0 GHz + Adreno 612 GPU). Memory: 8GB of RAM; 128GB storage; microSD slot up to 256GB. OS: Android 9.0 Pie with Funtouch OS 9.0. Battery: 3,700 mAh Dual-Engine Fast Charging. Connectivity: Dual SIM; microUSB (USB2.0), Wi-Fi, Buetooth 5.0, GPS, OTG (NFC available only in Hong Kong, Taiwan, Singapore and Russia). Misc: Under-display fingerprint reader; 3.5mm headphone jack. The unit we received came with the usual user manuals in the box, a compatible fast charger and transparent plastic case with silicone side bumpers. And don't worry, the case is designed to play nice with the periscope.